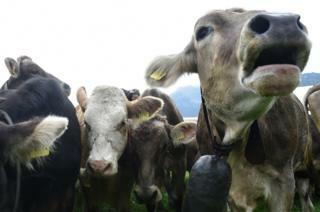 Cowbells can continue ringing out on a Bavarian farm despite the neighbours' long-running complaints, a Munich court has ruled. It was the latest setback for a couple from Holzkirchen, a peaceful market town, who first sued five years ago. But they plan to appeal again. They argue that dairy farmer Regina Killer's cows keep them awake at night. But a leading Bavarian politician, Ilse Aigner, said "the cow - with its bell - is part of our rural way of life". The couple, who have not been named, also object to the bad smells of manure and the accompanying insects. In court their lawyer had played a recording of the cowbell noise, measuring more than 70 decibels at the couple's bedroom window. But the court found the evidence unconvincing. The couple were not satisfied with a settlement reached with Mrs Killer in 2015, which instructed the farmer to keep her cows at least 20m (66ft) away from the neighbours' property. Mrs Killer, quoted by the daily Süddeutsche Zeitung, said "this is a matter of our traditions" and "if it goes on like this, it'll be the end of Bavaria". Mrs Killer and her legal team maintain that cowbells are there in case the animals escape as they allow the farmer to hear where they are, even at night. Holzkirchen's mayor Olaf von L?wis said "grazing is a common practice in our area and is an important pillar of agriculture". Mrs Killer's cows spend the winter months in sheds.